After a spooky "Ghosts of Stuyvesant Town" walk with ABF, we stopped at Peels on Bowery for a late night snack. It was a bit late for dinner, but it's never too late for dessert, amIright?! Peels is a dimly-lit but boisterous restaurant right on Bowery. We saw a bachelorette party, couples of all ages, and a few solo diners as well. All kinds are welcome at Peels! I ordered their apple pie (a la mode, of course) and a mug of their hot chocolate. The pie was pretty good, though I like my apples cooked a little bit softer, but it did taste like homemade! ABF also ordered a latte-- some lovely foam art capped a rich, lush cup of espresso. He is a coffee man if I ever met one, and he loved this. The hot chocolate, however. Oh. My. Word. This could be dessert on its own. It's almost too much for one person. Almost. I managed, somehow. Wow. I'd go back just for that! ABF ordered a butterscotch pudding---and it will come as no surprise to regular visitors to Stuff I Ate that once again, his ordering radar was triumphant once again. This was outstanding! I think it might have been a featured dessert, so I'm not sure if it's still there, but holy COW. The salty/sweet walnuts on the side really made the dish. I still have yet to try the savory side of the menu, but Peels nails it with the sweet/salty desserts and the lush hot chocolate. 'Tis the season-- go grab a cup and let me know what you think! This is a guest post by my dear friend Jen A! 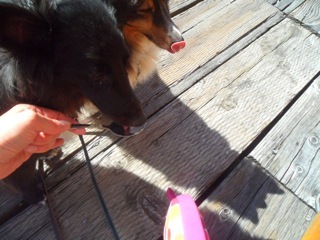 She and her BF, Tom, made a cross-country trip this summer with their adorable Shelties, Breezy & Morgen (Breezy's on the left in the below photo). Jen is blogging about a spot that's both human AND dog-friendly! 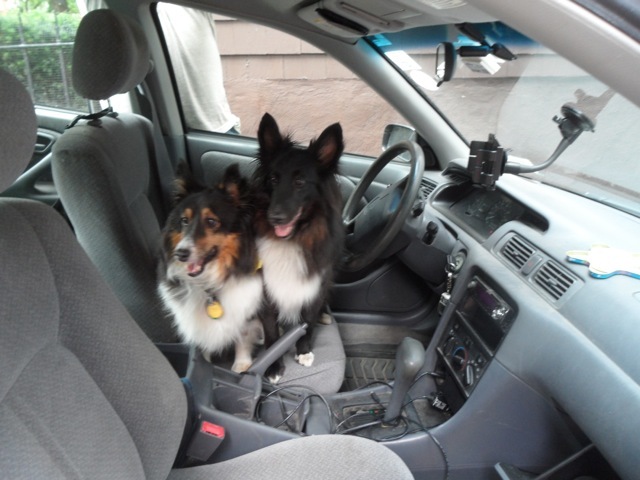 While New York City was sweltering and boarding up windows for an impending hurricane, Tom, the pooches and I were enjoying a luxurious ride along the Oregon coastline. After a visit to the Sea Lion Caves, we were on the hunt for some West Coast seafood. Completely by accident (isn’t that the way to discover all of the best restaurants?) we came across the International C-Food Market in Florence, Oregon. 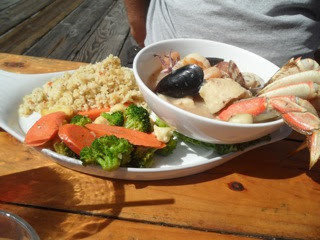 We were immediately lured in by samples of their creamy clam chowder and signs assuring us that they were pet friendly. Pet friendly, indeed! 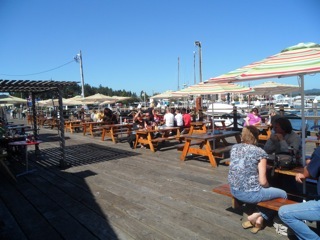 Their beautiful patio overlooking the water was filled with dogs and their owners enjoying a late afternoon lunch. I decided to brave the drink menu and attempt a Bloody Mary. Not very original, but it’s a drink I really want to like and just...can’t. But, the pearl onions and olives just called to me. 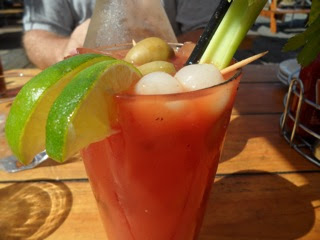 This was possibly the best Bloody Mary I’ve ever had. Just spicy enough and not too thick. I still could only finish about half of it. In the end, I think The Mary just might be too much drink for me. But if you are a fan, I highly recommend. Of course, after our little sample of clam chowder, we had to go for the bowl. Bacony, clammy chowdery goodness! Every bite was packed full of clams and this soup was not drowning in large, under-cooked potatoes as so many are. 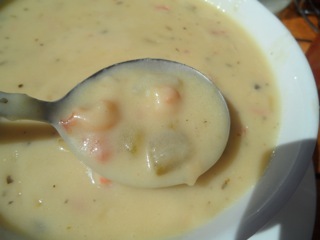 This chowder was fresh and all of the flavors came through in every bite. Luckily for me, Tom doesn't love to share soup. So after a bite or two, it was all mine! Next up was the pan fried razor clams. Neither of us have ever tried razor clams, and it was quite a surprise. I was expecting deep fried, which always kills all of the flavor. 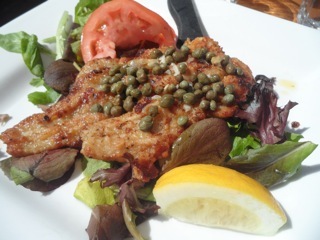 This dish was carefully and lightly fried in butter and lemon. The flavor of the locally caught clams was rich and delicate all at the same time. I might have given Tom a bite or two and then forgotten to offer him more. Whatever. There were definitely not enough of these on the plate. Finally, we opted for a seafood medley, which included crab legs, scallops, octopus, muscles and some kind of flaky white fish. Skip the rice and overcooked veggies that come with it. This was probably my least favorite part of the meal, although the scallops were cooked perfectly. Very tender and not rubbery at all, which is often a problem. The sauce was good, but not very memorable. International C Food Market is a trans-fat free restaurant and you can read all about the evils of hydrogenated oil on their menu. 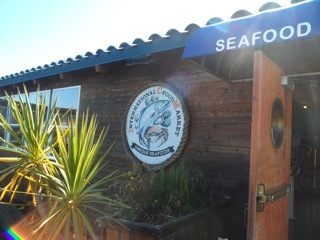 The fish are all caught locally in Florence, Oregon.